One of our customers asked whether it would be possible to allow them to edit invoices once they've been raised from a job. They were finding that, often, additional information that would need to be included in the invoice, such as a PO number, would arrive after the invoice was raised. Other times, they may need to add or edit an address. The solution is to raise your invoices in Draft mode and then edit information such as the addresses, details or invoice amounts etc. at a later stage. Once you're happy, click Submit invoice and your customers can view the invoice straight away when once logged into Okappy. Alternatively, you can email your invoice to them once ready. Following is our quick guide outlining how to raise a draft invoice, edit details and then submit the finalised invoice, ready to be viewed by your customer. 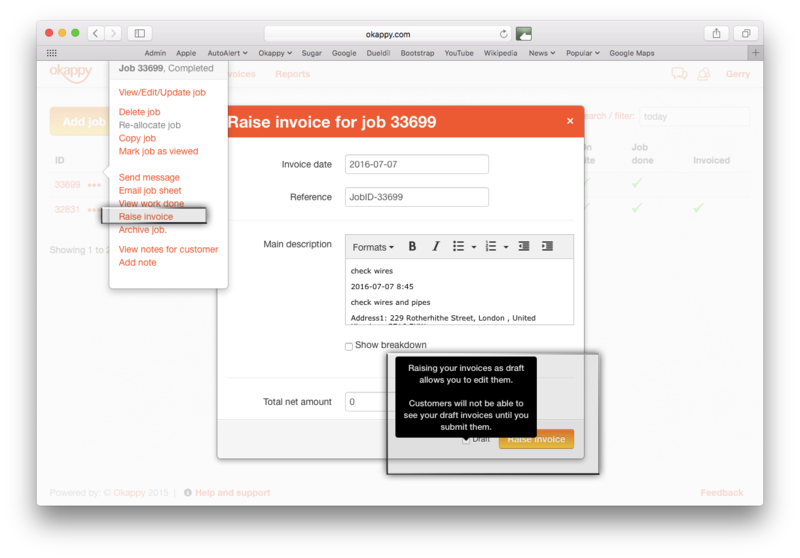 Once a job is complete, click Raise invoice from the Jobs screen to open the modal. To ensure the invoice is raised as draft, tick the checkbox next to Draft at the bottom of the modal. 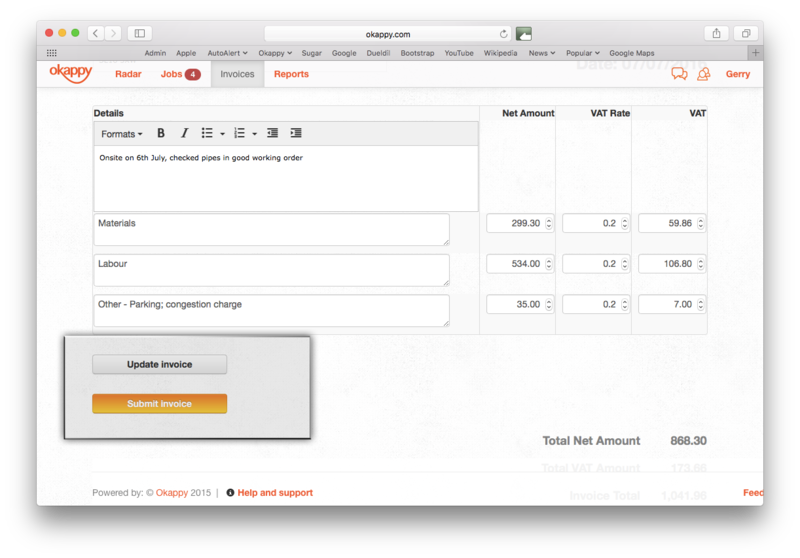 When you raise an invoice in draft mode, you can edit it further. Your customer will not be able to see the invoice until it is submitted. 2. To view the invoice, go to the Invoices screen. All draft invoices are marked (Draft) as you can see below for the invoice raised towards Job ID 33699. 3. Click Invoice 1460 (Draft). You can edit the invoice address, reference, details and amounts. 4. Once you are happy with the details on the invoice, click Update Invoice to save the changes. The invoice will be updated but will remain in draft status until it is finally submitted by clicking the Submit Invoice button. 5. Once you have submitted the invoice, your customers will be able to view it from their own Okappy account. Alternatively, you can email a copy of the invoice to them. 6. You can see from the Invoices screen that the invoice is not in Draft mode anymore. You can now export it to your accounting package. Check out our Help & Support pages to see information on all the Okappy Job Management features designed to make your life easier.